Britain’s Anthony Crolla suffered a defeat via fourth-round knockout from the hands of reigning WBO and WBA lightweight champion Vasyl Lomachenko in a boxing match which went down last night (Fri., April 12, 2019) from inside Staples Center in Los Angeles, California. 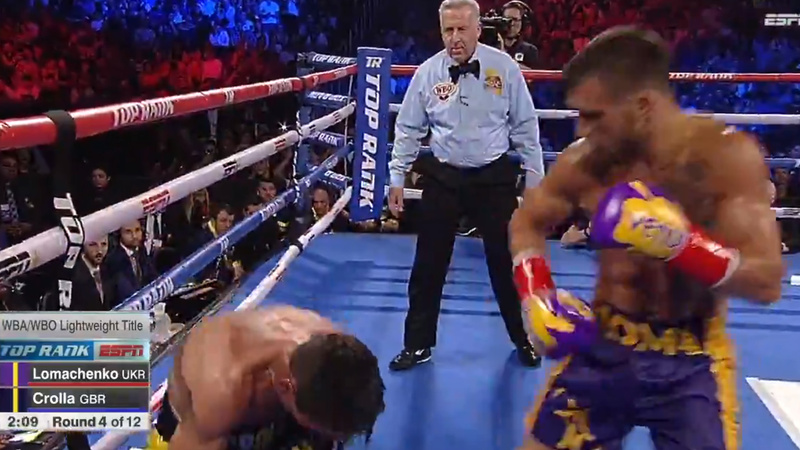 Lomachenko brutalized his opponent throughout their fight. In the opening frame, Vasyl Lomachenko carefully gauges Anthony’s movements with tricks and pressure. After observing the scene, Vasyl unleashed vicious combinations in the third round that dropped Crolla against the ropes. Lomachenko started to celebrate by leaping on the ring ropes; however, referee Jack Reiss said fight should continue. By the fourth round, Lomechenko continues his onslaught. He landed a few shots on Crolla. Lomachenko went rogue and landed a crisp left hand followed by a vicious right hook on the side of the head that put Crolla dropped and sent the Anthony into a faceplant on the floor. The 31-year-old Lomachenko once again proved everyone that without an ideal opponent he still puts on a quite show and let the world know that he’s the best pound-for-pound boxer in the world. Two-time Olympic gold medallist Vasyl had shoulder surgery last year and it showed his performance last night was way impressive.